There’s a long tradition of home cooking in my family; specifically my Mother’s side. While rooting through the remaining possessions of my great aunt Vi little over a week ago, we stumbled across a recipe for Scripture Cake written either by her or my great great grandmother on my grandfather’s side. What else was there to do but give it a try? It’s impossible to tell how old the scripture cake recipe actually is, but one can be fairly certain its origins rest firmly in the first half of the 20th Century; it’s yeast leavened. For ease, this is the only changed aspect of the original instructions. 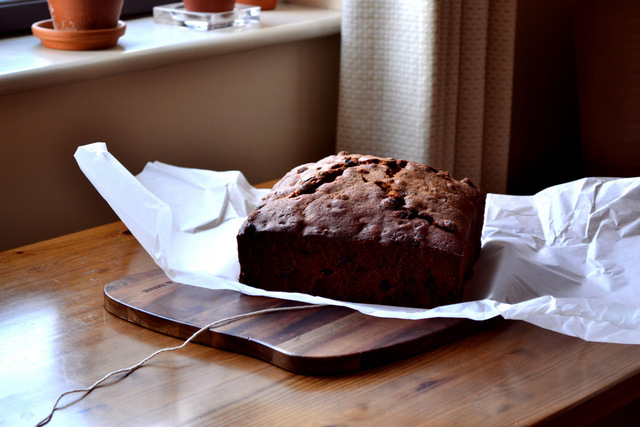 Otherwise, this cake is the real deal, full of raisins, figs and honey. Delightful! Yeast can be unpredictable and since the quantities had to be converted from cups to grams, it seemed a safer bet to substitute baking powder. The consistency this recipe achieves is as you’d expect; dense and heavy, but not at all dry. 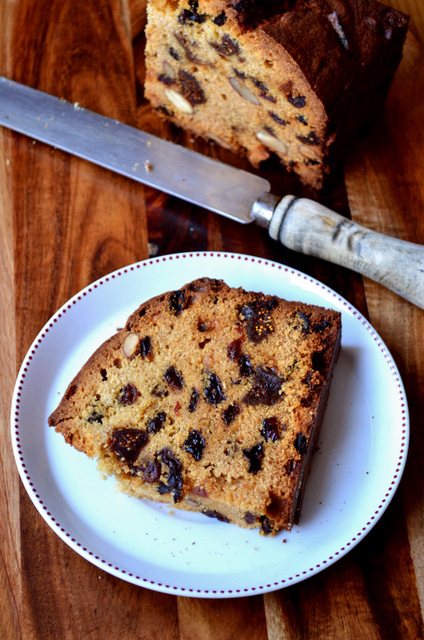 Scripture cake, as it turns out, is a rather pleasant fruit cake. Glancing at the recipe you may be somewhat put off by the sheer volume of ingredients. I mean, who on earth puts 550g of flour and 6 eggs in a cake? Well, the result is absolutely as you’d expect; biblical in every sense. Use your very biggest cake tin for this one; it can’t harm. Mine almost wasn’t big enough. Make sure you leave plenty of time too; it takes 4 hours. Other than that, however, it’s actually incredibly simple. The only instructions that came with the recipe were to cook long and at a low temperature. The rest have been surmised. Preheat the oven to 160C/140C(fan). Grease and line a deep 20x20cm cake tin. Cream together the butter, sugar and spice. Whisk the eggs separately and beat into the mixture little by little until fully incorporated. Fold through the baking powder, salt and a third of the flour. Stir in the honey and half the milk. Fold through another third of the flour, followed by the remaining milk. Gently incorporate the remaining flour. Finally, stir through the dried fruit and almonds. Transfer the thick batter to the prepared cake tin, level off and bake for 4 hours. The cake is ready if a knife, when inserted, emerges clean. Set aside for 10 minutes before turning out onto a wire rack. Leave to cool completely before eating. It can be frozen if needs be. Cost: Let’s be clear – if clear wasn’t my strong point in previous paragraphs; this is a big cake. Large. Biblical. I’d love to say it cost me 23p to make, but that would be a lie. But it’s difficult to turn your nose up at £6.50 for the entire delicious monstrosity; that’s pretty frugal in my opinion. Assuming this cake yields 24 slices – at the very least – the price per slice equates to 27p. Blimey. I’m not familiar with a scripture cake, but I am fascinated by it and the origin of the ingredients. This sounds really good. I’m going to give it a try, thank you! Thank you – please do, it was wonderful. Nick this is so fascinating! Scripture Cake. I love ancestral recipes, something so inspiring about recipes that stand the test of time. The cake looks lovely and equally delicious! Absolutely – it was amazing finding the recipe. I’ve heard of Scripture cake but never tried it. This does look and sound amazing with all those figs and honey and spices in. 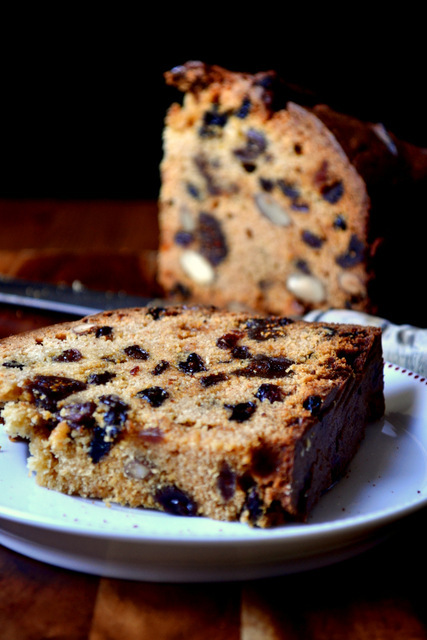 Perhaps it would even be a good substitute for a Christmas cake, to please those who like a less dense fruit cake? Yes – a very good sub. In fact, we’re doing just that. I may try it with yeast my self! It looks like a cake that lasts a good while. How long will it keep it stored well? Honestly, this looks so much better than the congealed fruit cakes I find here, in Canadian stores. I’m thinking of adapting this recipe and serving it during the Christmas season, would it still be scripture cake if I soaked the fruits in liqueur? If you can find a mention of a particular alcohol in the Old Testament then it’s still Scripture Cake! I’m trying to to decide if I dare give it a go converting it to Anerican measures and gluten- egg- and dairy-free all at the same time. Could be epically bad on a biblical scale, then again…maybe not. Thanks for sharing. You can do it! Let me know how it works out. 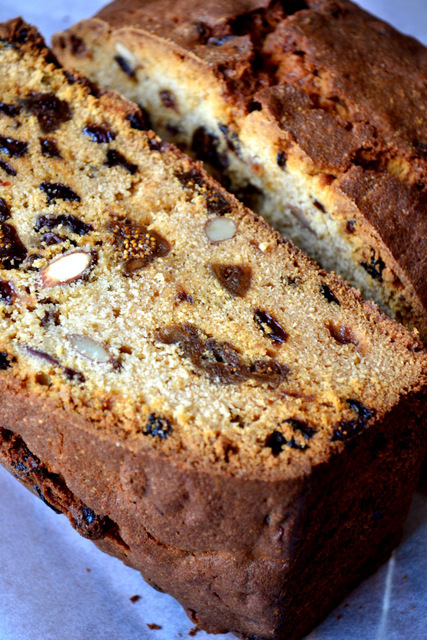 This reminds me so much of Italian Panatone – its more like a dense sweet bread served around Christmas. Memories! Isn’t it interesting how the name of a dish can be a real audience grabber? I instantly wanted to know what a Scripture cake was. Interesting. Excellent – sometimes words work better than images! Thank you! It really was divine. I saw a version of this in a cookbook I have and it related each ingredient to a passage from the scriptures – what a wonderful thing that you came across the family recipe! I know; I just couldn’t not cook it! The cake looks and sounds delicious. And to have the recipe handwritten by your ancestress –what a treasure! Great idea – comment back and let me know how that goes! Here is my recipe for Scripture Bread.